Yesterday, an acquaintance from my neighborhood, Aldo, asked me if I would help him get fit fast. He said that he has seen how I went from a fat guy last year to a lean one this year. When I met him last night, he was just coming out of a deli with a reese's peanut butter cup, a hershey's chocolate bar, a donut and a bag of chips. And that was before his dinner! He really is not in too bad of shape, but sort of flabby, not as good as he could be doing, so I told him that he has to give it at least three months, from today to the end of March, just 12 weeks. He knew that I had been the originator of ‘Hashi Mashi', the breakfast item in the Cafe, and that it meant no bread, so Aldo asked me if there was a way that he could do this and still have some bread every day. Initially, I thought no way. He has to give up bread, pasta, rice, everything like that, just like I did. But then I thought that makes no sense, there has to be a way that he can get benefit from just having real foods, as much as possible, and a few slices of whole grain, as opposed to highly processed bread, should be fine. We will find out. You are welcome to follow along with the program that I am setting up for him. It is going to be based on three main meals, with alot of vegetables and a little protein, plus whole grain bread. In between his meals, I am going to make sure that he has his fruit as snack, either berries and almonds, or a smoothie with protein, and some other type of fruit. I have seen Aldo around for the last ten years or so when he first came to the City from Brooklyn. I do not know much about him other than the fact that he lives in the area, frequents the same cafe, does not say too much, so I was surprised when he sought me out and asked if I would coach him. So the first thing that I asked him to do, after he agreed to stick with it for three months, I asked him to not have dinner past eight, even better, past seven. He admitted to me that usually, he does not eat much during the day, but he does the lion share of his meals after 5pm, when he gets back from work, till eleven, sometimes even midnight! That seems like a sure recipe for disaster. He also told me that he rarely falls asleep before 2am, which I am sure is because he eats till twelve, so how is he going to fall asleep at 12? I also asked him to please have a ‘no excuses' attitude. Whatever has happened in his past, he has to let it go, move forward, do not use the past as an excuse why he cannot do the right thing in the present and the future. Do not use the past as an excuse as to why he must have chips, good humor ice cream, muffins, whatever it is, pizza, do not use the past as the excuse. Do not use the present as an excuse either, even if he has frustrations and unfinished business, do not use whatever perceived slights or insults that he feels, as the catalyst for eating food that will not fuel his body properly. He gave me his word. So, last night, he had his last meal at the Cafe, he told me that he had couscous, chicken, a slice of carrot cake, an oatmeal raisin cookie, a chocolate chip cookie, 2 rolls, a twix bar, 4 oreo cookies and water, but he finished all of that before 7 pm and promised me that he would get to sleep before midnight. He did better than that, he got to sleep by 1130 and was up by 8am. Not too shabby. You heard of the City that never sleeps, as glamorous as that sounds, it is not good for health. I asked Aldo to weigh himself and let me know what his weight was this morning as well as his bodyfat percentage. I lent him my scale, and he is going to pick up his own weight watcher scale or any other type that measures bodyfat for himself today. Aldo is 6'1″ and as of this morning, his weight is 197.3lbs and 23.6% bodyfat. What would his ideal weight be? I do not even know how old he is, I am guessing over 40, or over 50. Rush University Medical Center ideal weight chart says that a man who is 6'1″ should be anywhere between 161 and 202lbs. So, Aldo is, therefore, I do not want to go by weight only. We have to go by bodyfat percentage. When he has a better body fat percentage, then he will be able to get into 32″ jeans, which I think is his real goal. To be lean, to have a flat stomach, to feel good, no more lethargy, more energy. 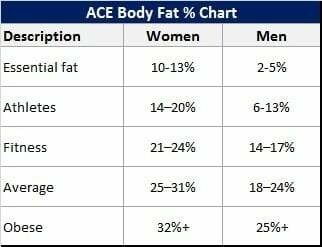 Here is the ACE ideal body fat percentage chart that I shared with Aldo below. As you can see, for a man, Aldo is in the average range, as he is below 24% body fat. For him to be in the fitness range, he has to go down to 17%, and to become an athletic range, he has to be between 6 – 13%. I told Aldo that our target will be 174lbs and 13% bodyfat. That will definitely bring him to 32″ waist territory. Once that gets done, take out the egg omelete and either toast or pan toast the whole grain bread. Make your sandwich and voila. The point is that the majority of this sandwich is fresh vegetables. After this breakfast sandwich, we went on our way. A few hours later, Aldo called me up saying what next? He was hungry. I told him to stop in to a deli and get a plain chobani yogurt with a cup of fruit or any berries, and top with nuts or honey. Pretty simple. For lunch I told Aldo to make a salad from the same ingredients as breakfast and add a few slices of turkey and have that before 3pm if possible. I want him to get in two more meals at least, perhaps a protein shake from banana strawberry protein powder and peanut butter and another meal. I have to go through his list of favorite dinners and figure it out. Will be back shortly. And last but not least, I want him to get in a workout. I will update this post later with the workout, most likely it will be squats. For dinner, I suggested to Aldo to lay off of having any more bread, as he already had whole grain for breakfast and lunch, and he told me that so far today, he was feeling better than any other day , at least in terms of overall general well being. He is not stuffed and he is not hungry. That is because we kept him satisfied throughout the day with as much real food as possible. If he had rice at home, I might have suggested a half cup of rice for dinner, but since he had oatmeal, we went with a half cup of oatmeal and a veggie burger. He likes veggie burgers, so we went with that. Since the YMCA was not open today being New Years Eve, I could not take him to show him how to do squats, so instead I showed him free standing squats and had him do 5 sets of 5 squats, going below parallel. I also had him start light with some pushups. Truth is that he could only do one pushup with good form, so I had him do 5 sets of 1 pushup, and just to round things out, I had him take a brisk 20 minute walk. That was enough for today. I told him that if he gets hungry, he can have a smoothie made from either 1% milk, unsweetened almond milk, table spoon of peanut butter, protein powder and some berries mixed in, if not, forget about it. and last but not least, to get to sleep by 11pm. Losing weight is the top New Year resolution in the United States. I wonder why, and I do mean that sarcastically. Of course it is, because the food processing companies have learned how to create processed foods that are quite addictive. Anyone who has grown up in this country just cannot figure out how to lose weight. It is not their fault, it is not your fault, it is not my fault and it is not Aldo's fault. The good news is that we can break free of the addiction by substituting enough real food so that your body will feel nourished. I will be making a chart to append to Aldo's transformation journey soon and I am happy to help anyone else on the same path.